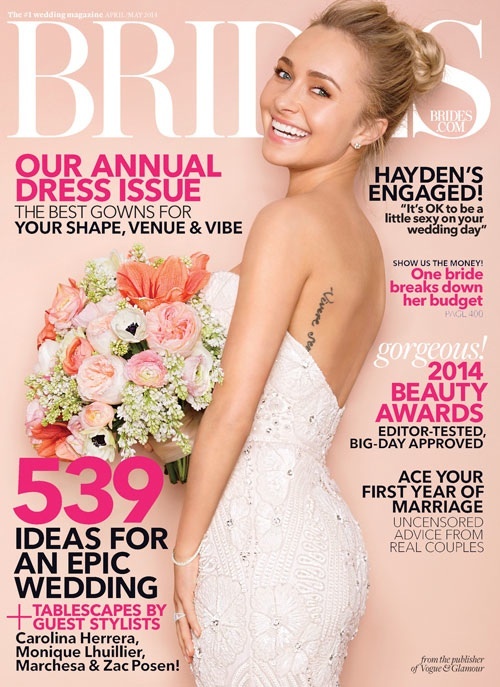 Hayden Panettiere has been positively glowing ever since she got engaged last October to Ukrainian boxer Wladimir Klitschko, so it's only fitting that the actress covers the upcoming issue of Brides. In the mag, the "Nashville" star tries on wedding dresses from designers like Naeem Khan, Oscar de la Renta, Marchesa and Monique Lhuillier. But in real life, the actress says her wedding will be a more laid-back affair -- not an over-the-top shindig we've come to expect from celeb brides. "I will not be a bridezilla. I refuse to let this make me a bridezilla," Panettiere told HuffPost Live on Tuesday. "My mindset on that is you plan it as much as you can, you try to be detailed, but at the end of the day when it comes time to have the ceremony, just sit back, relax and have fun and not expect everything to be perfect," she said. The 24-year-old's healthy attitude is apparent in her Brides spread as well; Panettiere is seen smiling from ear-to-ear, practically frolicking in couture. Check out all the pics below and scroll down for her HuffPost Live interview.